Hello! 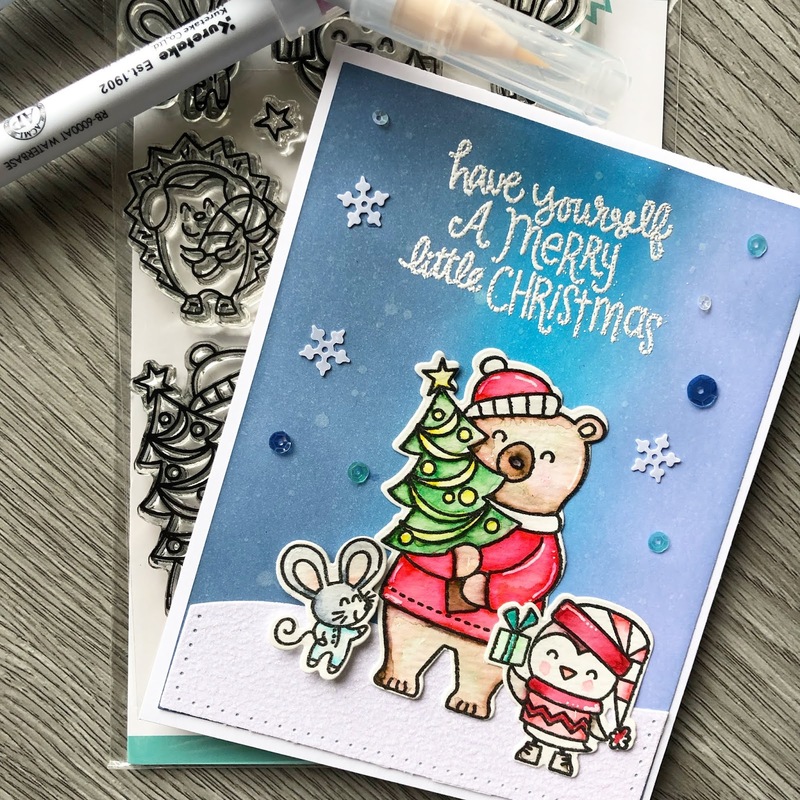 Karla here today to bring you a closeup look at the gorgeous Scrap Shotz November Kit Club featuring the Jen Hadfield Along The Way Collection. 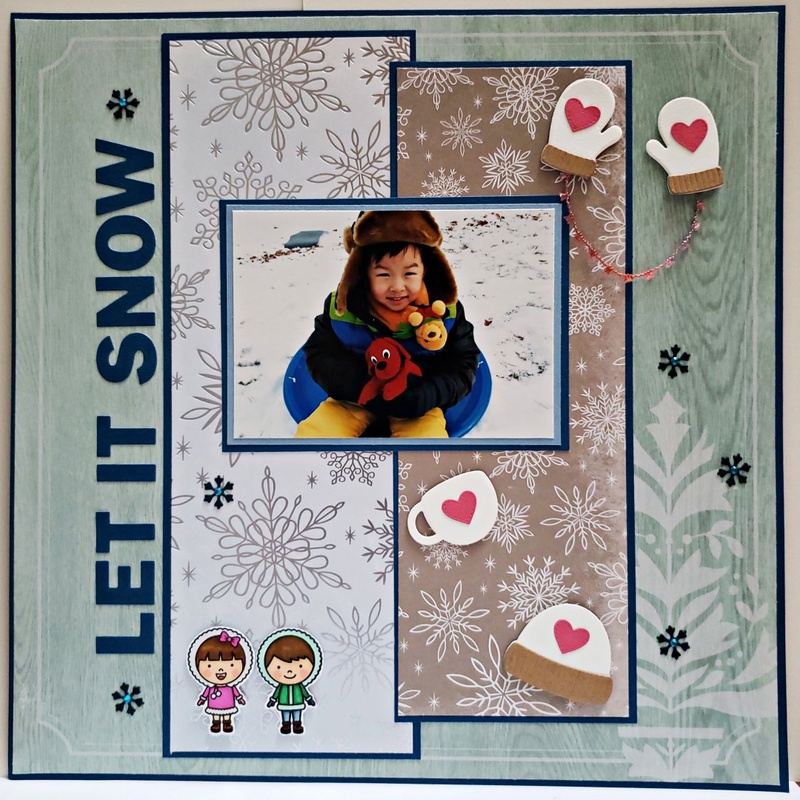 The papers, stickers and diecuts in the kit are going to be perfect to scrapbook your photos no matter what the season, and the colours are so beautiful! 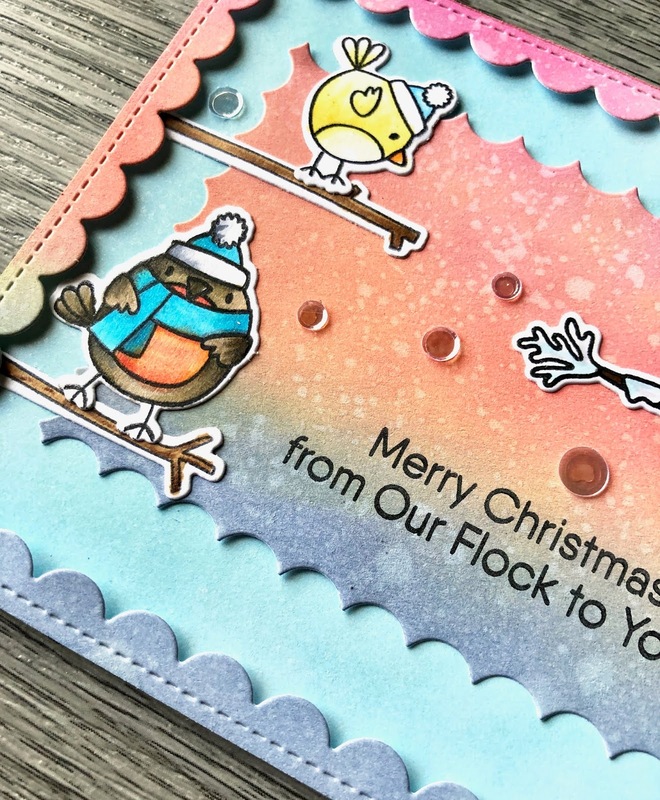 The lovely gold foil included in some of the diecuts will compliment the sweet gold foil puffy Thickers this month and the lovely blue glittery Kaisercraft tape adds just the right touch of bling! Here's a look at both sides of the papers included. So many gorgeous options! The Bazzill cardstock matches perfectly, and there are tons of embellishments! Check out the VIDEO here to see all the fabulous details! Thanks so much for stopping by today! You can find the kit at the Scrap Shotz store here, and pick up any fun Kit Add-Ons here. Have an awesome, crafty week friends! I stamped the images on copic friendly paper with Gina K Amalgam jet black ink. 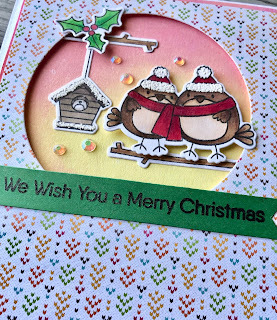 After colouring with copic markers I die cut the images with the matching dies and then applied embossing ink with the Lawn Fawn embossing ink pen over the white areas of the birds' hats and on the birdhouse. I then sprinkled Lawn Fawn Textured White embossing powder over the ink and heat seat. 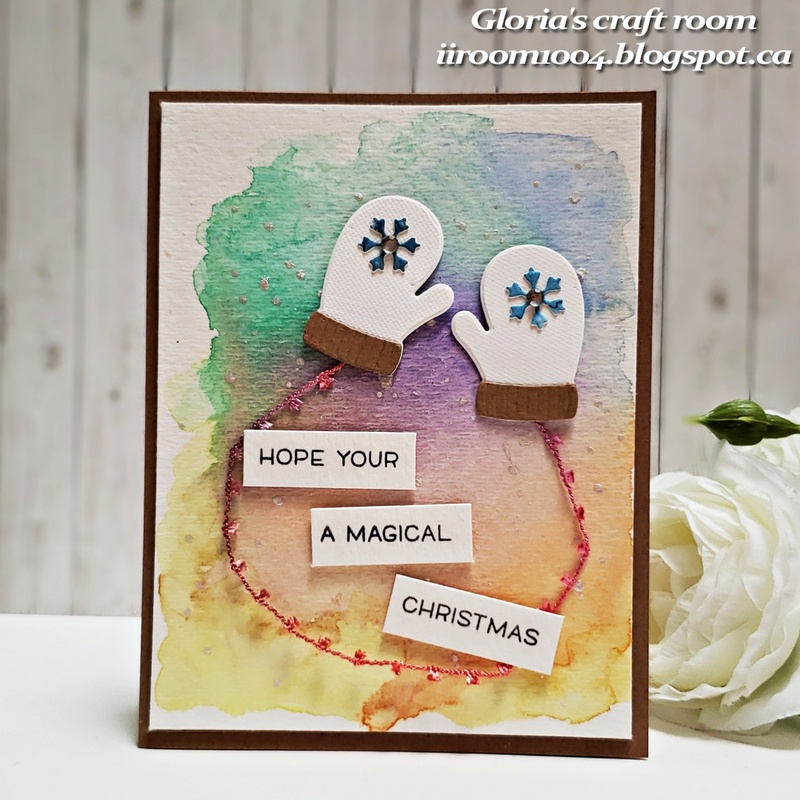 The background is created by blending Distress Oxide inks in Picked Raspberry, Abandoned Coral and Squeezed Lemonade and then misting with shimmer spray. I then die cut a circle out of a piece of Lawn Fawn 6x6 Knit Picky Fall paper to create the opening and adhered the patterned paper panel with foam adhesive over the inked background. The bird house and branches are adhered with the Lawn Fawn glue tube while the birdies and mistletoe are adhered with foam adhesive. The card is finished off with a sentiment banner and some Studio Katia iridescent crystals. 4 ¼" x 5½" panel with Distress oxide inks in Stormy Sky, Squeezed Lemonade, Abandoned Coral and Picked Raspberry, misted with water and die cut with the Lawn Fawn Reverse Stitched Scalloped Rectangle Window dies. The largest die created the window frame that is adhered with foam adhesive. The inner portion is die cut with the next size smaller window die, using the inside piece as the background. 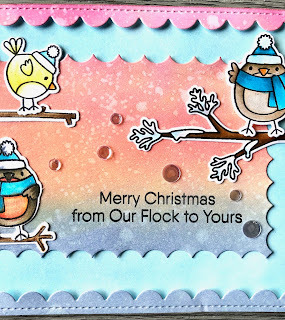 Sentiment is from the stamp set and Confetti mix sequins from Pretty Pink Posh add a final touch of bling to the card. Thanks for stopping by to take a look, stay tuned as the team will be sharing some kit projects very soon! I am back with another card featuring the Avery Elle Have a Merry Little Christmas stamp set. 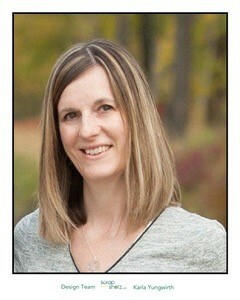 Here is another look at the images I was working with. The bear, deer with the blue hat and owl were colored with Prismacolor watercolour pencils. 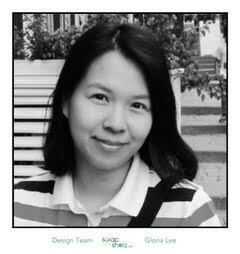 All images are stamped with Gina K Amalgam black ink. I die cut a sheet of blue diagonal striped paper from the Lawn Fawn Really Rainbow 6x6 paper pad and the window from the rainbow snowflakes paper in the same paper pad. The die used is the Mama Elephant Peek a Frame die. I also added a few highlights with a white gel pen. The sentiment is gold heat embossed and from the Lawn Fawn Winter Village stamp set. 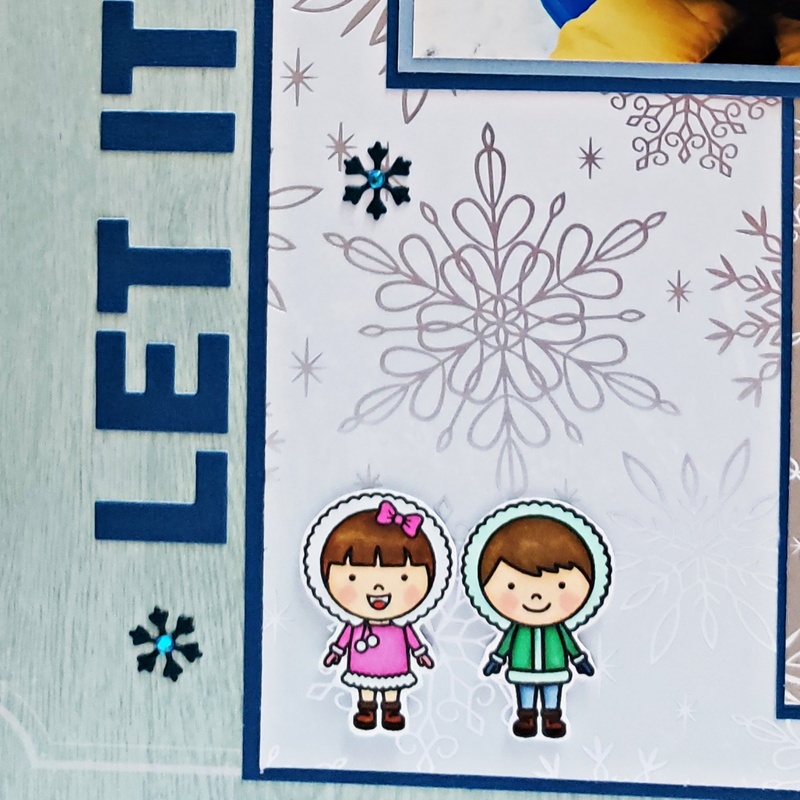 After arranging and adhering everything on a white card stock panel, popping up the sentiment strip and hedgehog with foam adhesive, I adhered the panel to a Kraft card base. The final touch is a smattering of gold Studio Katia sequins. Happy Thanksgiving to all our American Scrap Shotz friends! Rosie here with the first of a few posts featuring the Avery Elle Merry Little Christmas stamp set and matching dies. I began by watercoloring these images stamped with Gina K Amalgam black ink which is can be used with both alcohol and water based markers. I then colored the images with Zig Clean Color brush markers which are water-colour type markers. The images were also highlighted with a white gel pen, Nuvo crystal drops and a glitter pen. 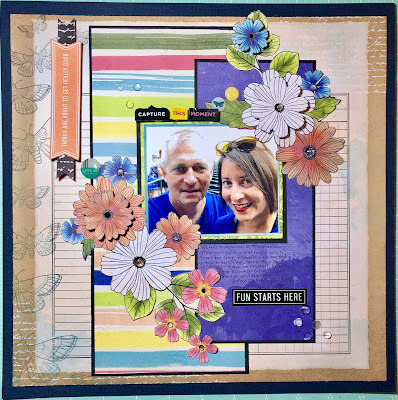 The background is inked with Distress Oxide inks in Shaded Lilac, Salty Ocean and Faded Jeans and then sprayed with Imagine Crafts Frost shimmer spray. 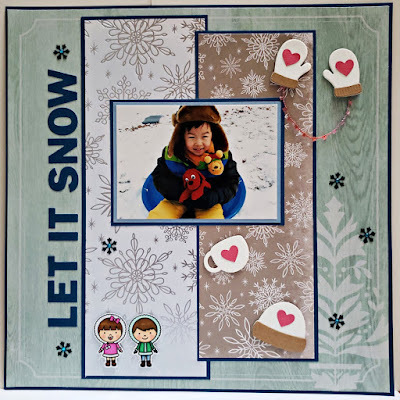 The snow background is an offcut from another card cut makes a great snowy hill. 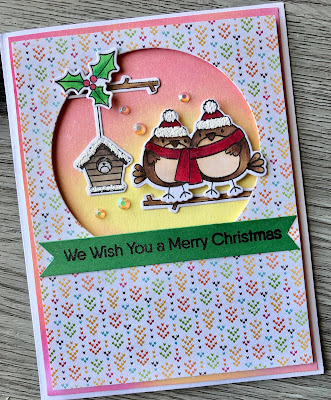 Studio Katia Winter Wonderland Fusion sequins provide some shine to the finished card. Thanks for taking a look and happy crafting! Today, I am happy to share my project reveal posting. 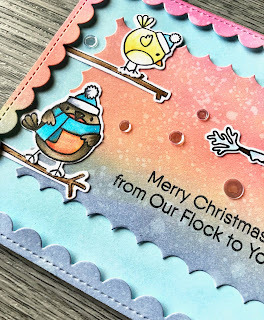 I made three projects with so adorable stamp and die sets. 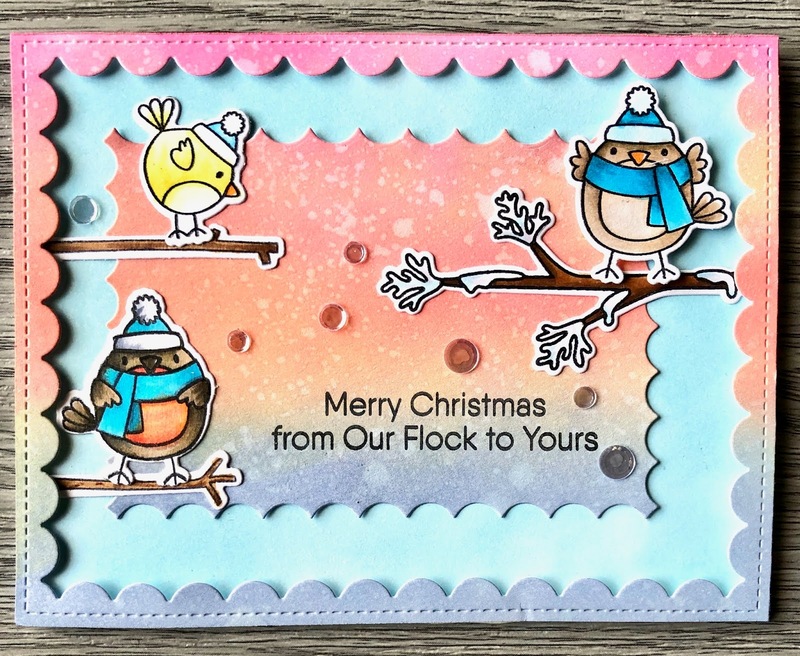 I used warm and cozy die set by Sunny Studio and How are ewe stamp set by Gerda Steiner Designes. My first project is 'Cocoa Pouch' card. I made reference to the YouTube video of Creative Paper craft. To make this card, I cut a piece of paper 8 1/2 " x 9 " and score it. And cut out some part from the scored paper and fold it. Adhere the box part with double-sided tape. 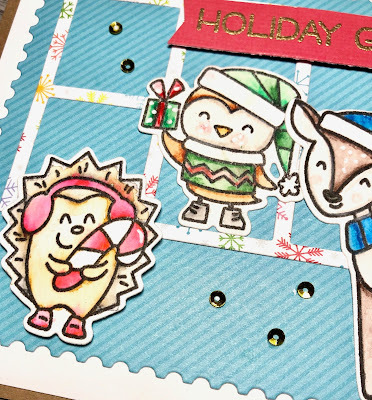 I die cut for making a hot chocolate cup with warm and cozy die set by Sunny Studio. And cut some Christmas papers and some letters for the sentiment. I mounted all elements as shown. This project is Eclipse technique card. The eclipse effect is one of my favorite techniques to highlight the beautiful shape of the die. For create this card, I blended a watercolor paper panel with Spide marmalade,fossilized amber,cracked pistachip, peacock feathers and salty ocean Distress Oxide inks using mini blending tools. And added some water spatters all over the panel. And die cut a hat from the center of the paper panel. 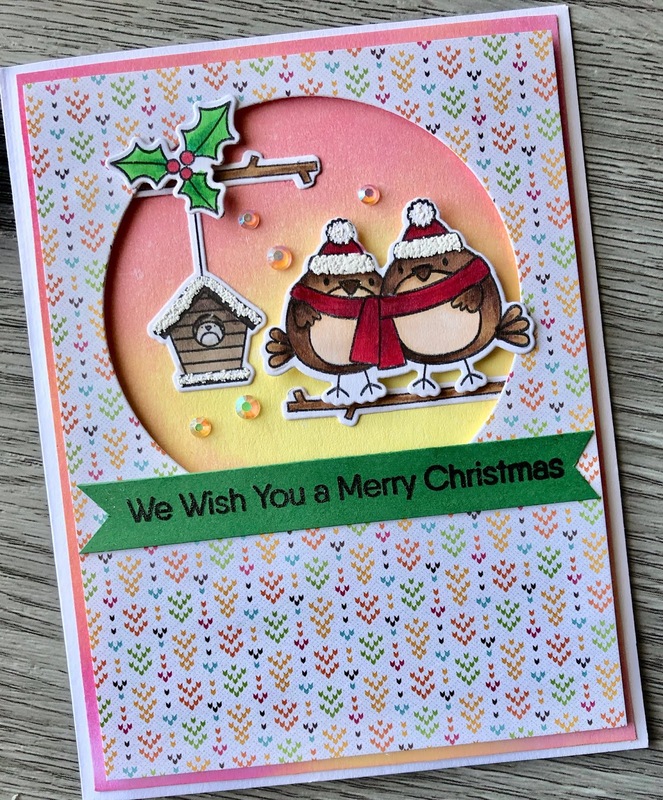 I stacked 4 other die cuts under the hat die cut using glue pen. I mounted it on top-folded card using double-sided tape, and then added some shiny sequins. 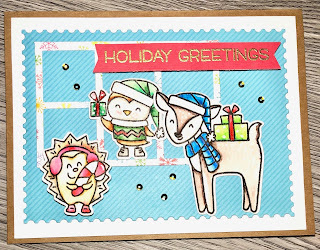 The last project is a card with How are ewe stamp set by Gerda Steiner Designes. I thought of picture frames hanging on a wall. For make this card, I made two frames first. I die cut stitched squares and cut two piece of square watercolour papers. I blended the part of watercolour papers with Cracked pistachio Distress Oxide ink using mini blending tool. 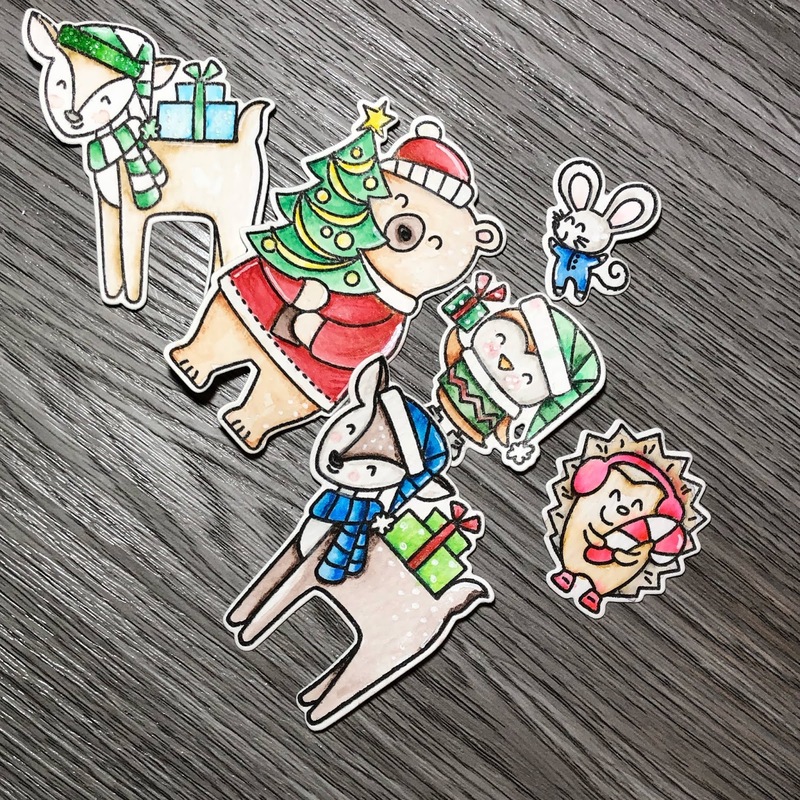 I stamped the lamb images on a white card stock and colored with Copic markers. I fussy cut the images and adhere on the small frames. Please always check what's new at the Scrap Shotz Store HERE! I used Eskimo Kisses stamp set, Here comes Santa stamp set, warm and cozy die set by Sunny Studio and Puppy Kisses for Santa stamp by Gerda Steiner Designes. I made a scrapbook page with Scrap Shotz November challenge's sketch. 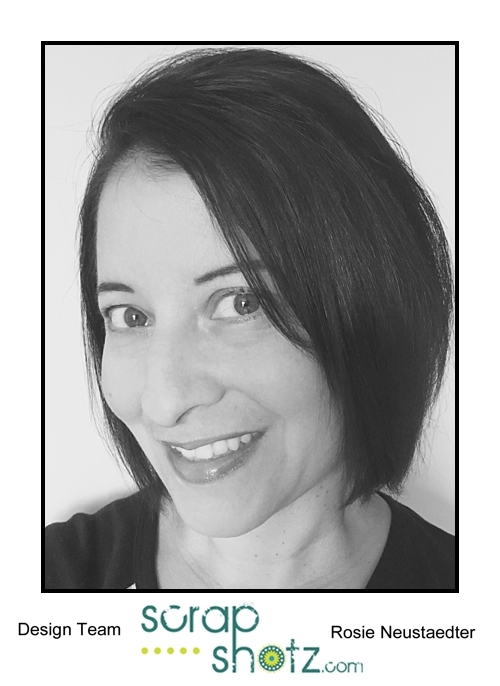 For create this project, I cut paper for layering with my paper trimmer. and die cut the sentiment. And die cut the mitten, mug, hat and snowflakes with warm and cozy die set by Sunny Studio. And stamped the cute couple with Eskimo Kisses stamp set stamp set and memento tuxedo black ink on a white card stock. colored the couple and fussy cut them and I adhere all the elements as shown with double- sided tape and glue tape. Here are a few step outs showing how I got my pieces together and adhere them all using double-sided tape. This project based on a sketch for this month challenge. 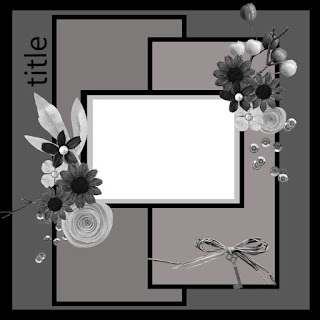 For detail, please visit Scrap Shotz November challenge posting here. My second project is made in patchwork style. 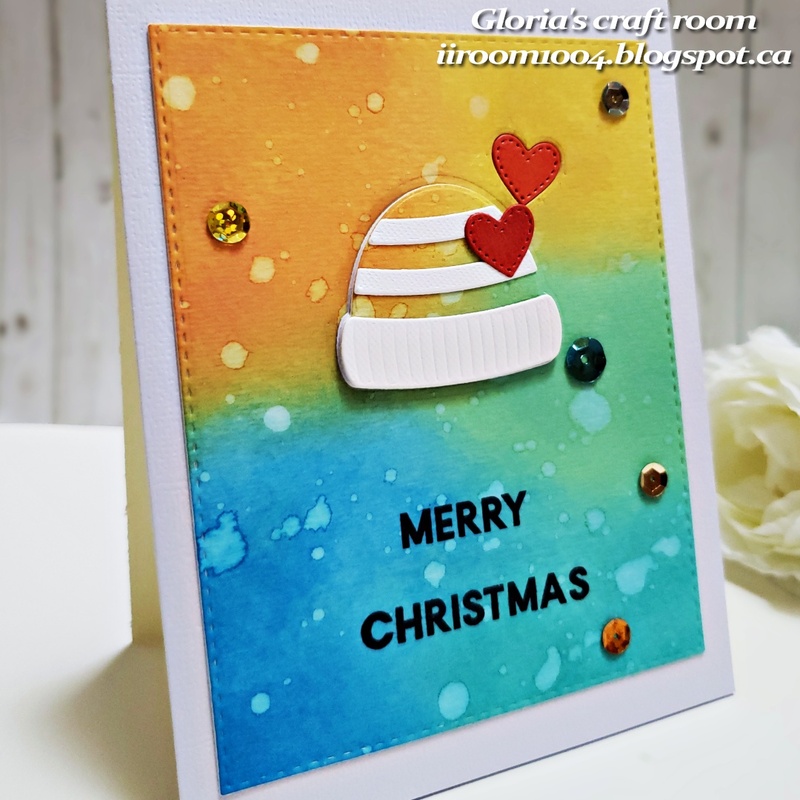 For create this card, I die cut rectangle, circle and square shape with white card stock. And I die cut the hat, mitten and mug with warm and cozy die set. I blended the hat, mitten and mug's edge with tumbled glass distress ink using mini blending tool. And adhere some pieces with glue pen. 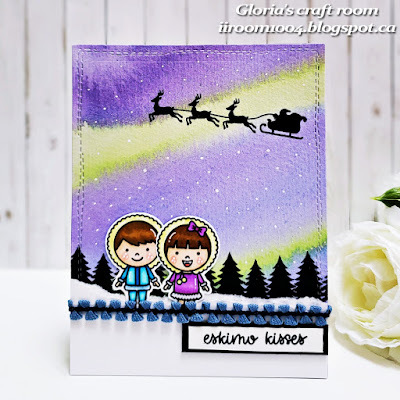 I stamped the Eskimo boy with Eskimo Kisses stamp set and Memento Tuxedo black ink. I colored the boy with Copic markers and fussy cut it. I get some pieces on the cut frames and adhere with double-sided foam tape. Here is today's last project. 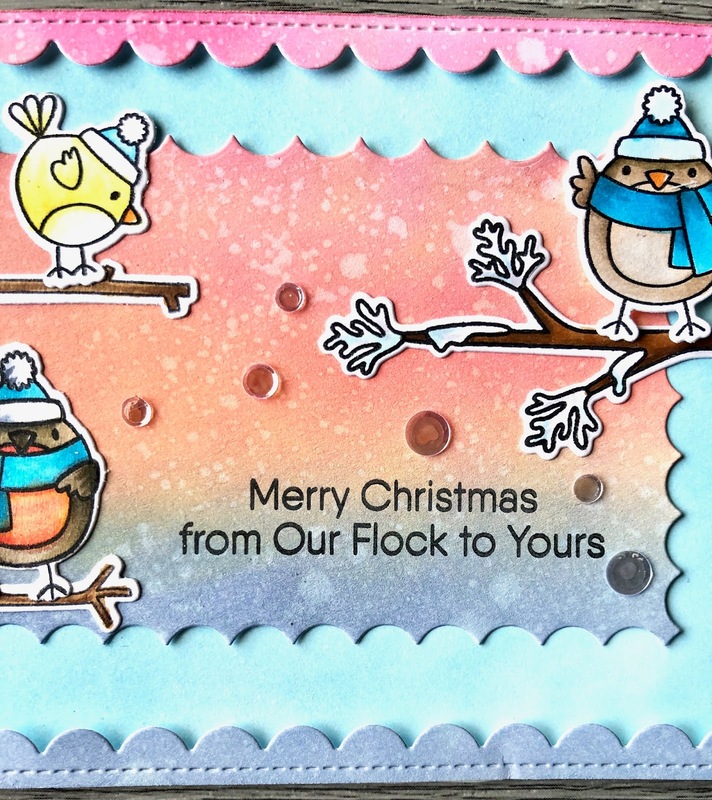 For create this card, I made the winter scene background. I used a masking tape for the boundary of sky and snow. I blended the upper part from the masking tape, with Salty ocean and peacock feathers Distress Oxide inks with mini blending tools. And added some water splatters only the blended part. 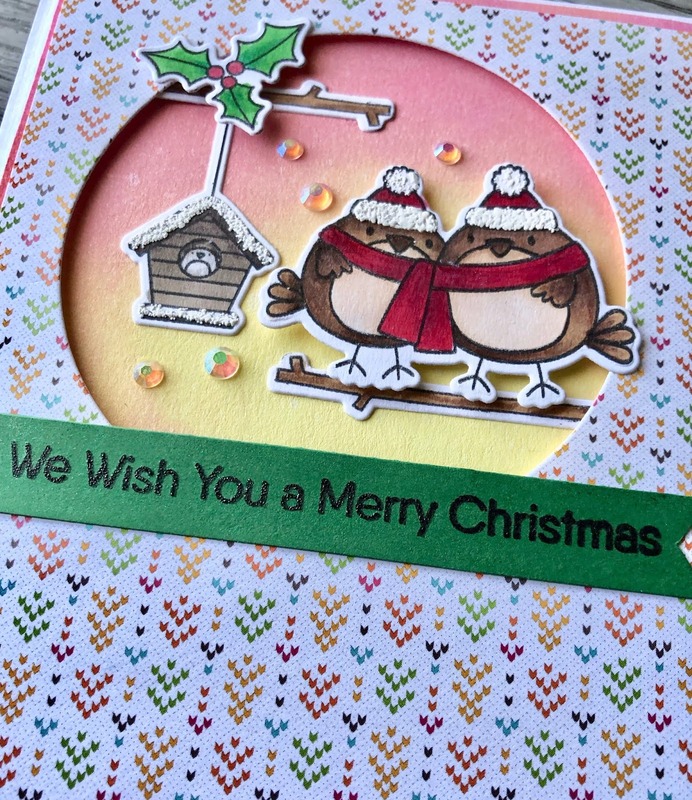 I stamped the trees with Here comes Santa stamp set and the sentiment. 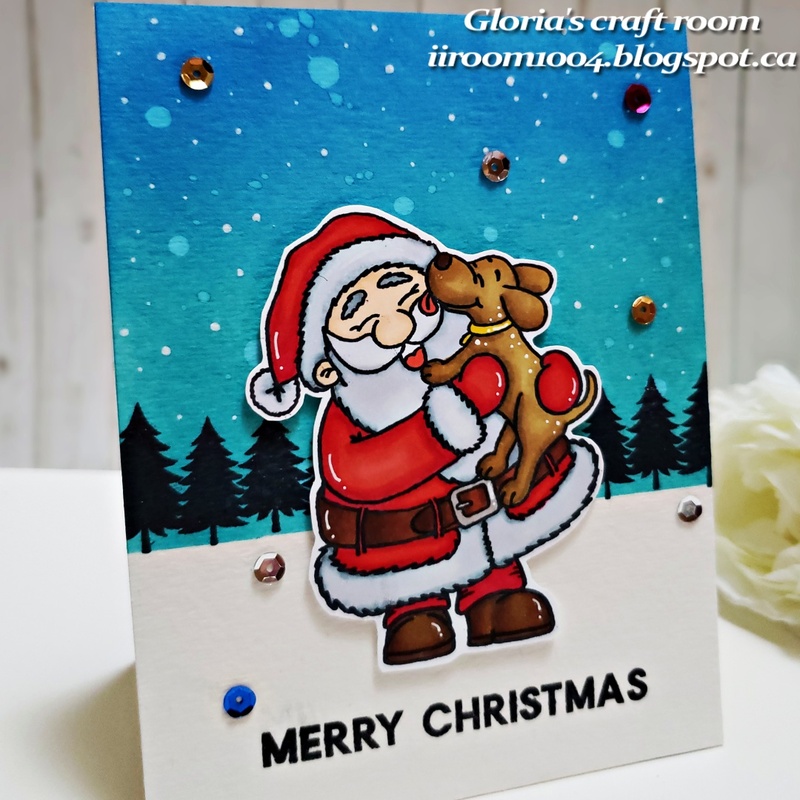 I stamped the Santa and puppy image on a white card stock with Memento Tuxedo black ink and colored with Copic markers. 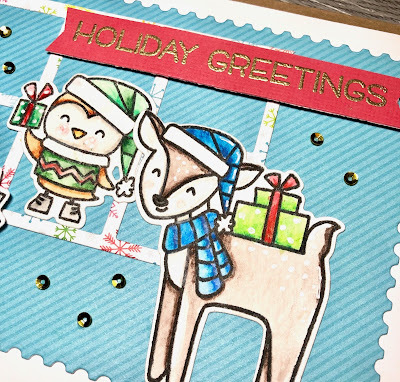 I adhere the Santa on the winter scene background with double-sided foam tape and added some shiny sequins. Gloria here today, I happy to share four projects with so adorable stamp and die sets. 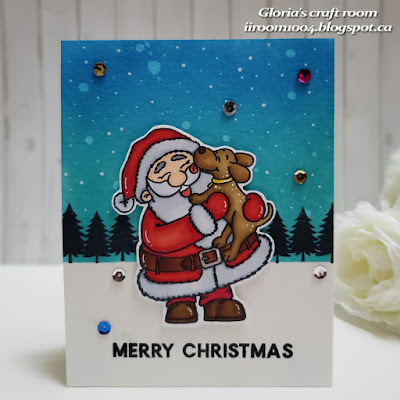 I used Eskimo Kisses stamp set, Here comes Santa stamp set, warm and cozy die set by Sunny Studio and How are ewe stamp set, Puppy Kisses for Santa stamp by Gerda Steiner Designes. These stamp sets and die set are really awesome! Today my technique is watercolouring background. Watercolouring is my favourite technique it is very easy and useful. I used Kuretake watercolours for these cards. 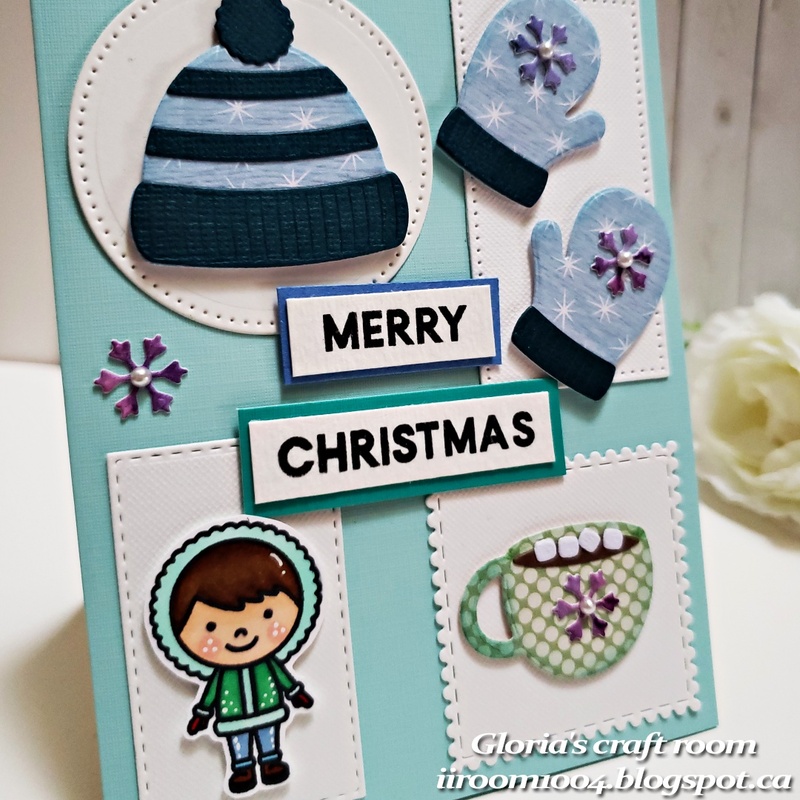 For my first card, I created a snowy night background with blue and purple watercolours and die cut using a snowflake die from warm and cozy die set. And added some snows with white gel pen. 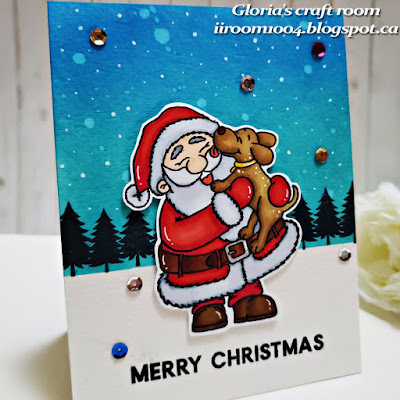 I stamped the Santa and puppy on a white card stock using Puppy kisses for Santa stamp and coloured with Copic markers, fussy cut them with my Cutter Bee scissors and adhere on the watercoloured panel with double-sided foam tape. Here is my second project. I created warm coloured background and added a frost white ink all over the panel. I die cut a mitten set using warm and cozy die set and adhere them on the coloured panel with double sided foam tape. Here is my third project. For this card, I try to express auroras in the winter sky. I watercoloured the night scene with purple , blue and light green and stamped sled of Santa and trees using Here comes Santa stamp set. 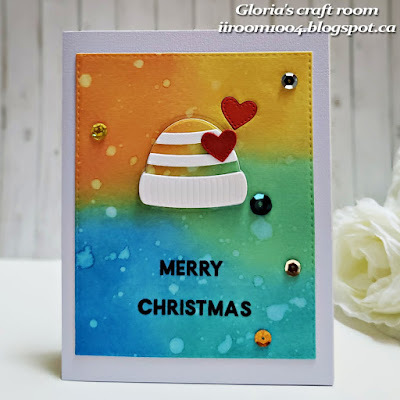 I stamped on a white card stock using Eskimo Kisses stamp set and colored with Copic markers. 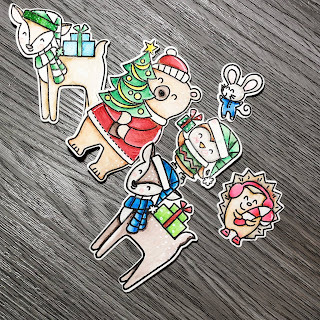 The 'Here comes Santa stamp set' are makes perfect Christmas background. Here is my last project today. 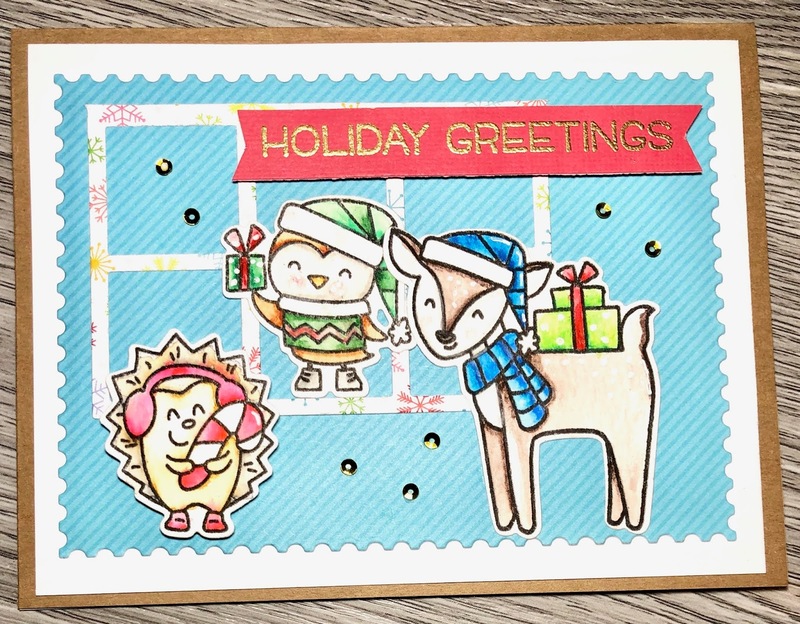 I love making my own pattern with stamp set and How are ewe stamp set are perfect for making my own pattern. 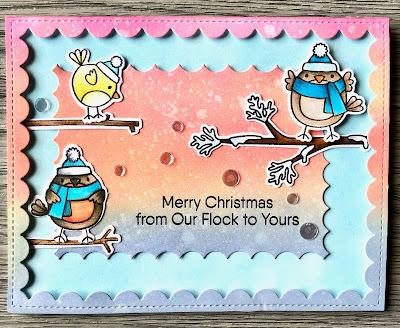 For create this card, I stamped the images from How are ewe stamp set randomly onto watercolour paper panel in pigment black, colored the background using a paintbrush, and added some shiny sequins. I hope you enjoy the post today. With the start of a new month it's time for a new challenge and you all are wondering who the October winner is...stay tuned to our Facebook and Instagram pages for the announcement as this post has been scheduled prior to the close of the challenge deadline. 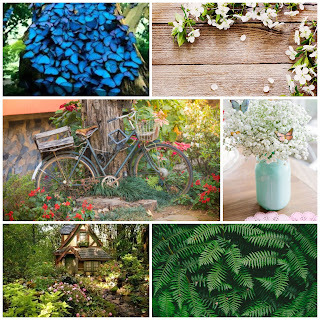 Design Team member Laura has created both a sketch and a mood board for your creative pleasure this month and the prize is a $15 gc to the store! Tag your project on Instagram with #scraphotzchallenge, if posting your project on our Facebook page please upload it in the comments to this post so we don't miss it! I have used the Vicki Boutin Field Notes paper and a die cut for the title and sticker from the Vicki Boutin All the Good Things release. We hope you take part in the challenge and look forward to seeing your projects!